The prevailing weather systems around here seemed to know that this was the official end of summer and the first day of fall/autumn. The weather forecasters talked about one or two small areas of prevailing fog but the coast in our vicinity should be clear. 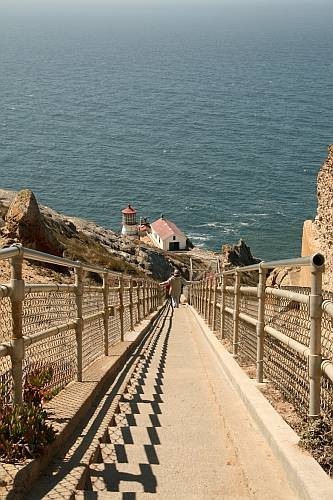 Blue skies and no fog; it sounded like a great day to go and see Point Reyes Lighthouse. We packed a lunch and set off. There is but one way over to The Point Reyes National Seashore and that is through Point Reyes Station so, for the first half of our journey we were covering familiar territory down the east side of Tomales Bay. The second half of the route initially took us up the west side of Tomales Bay through a place called Inverness. I hadn’t realized it before but, Tomales Bay being as long and narrow as it is, does resemble something of a sea loch, which perhaps explained the Inverness name. Inverness isn’t so much a town, as a collection of waterfront properties with boat docks. One of them, resplendent in wooden detailing complete with small onion domes on the roof, rejoiced in the name of “Tominsky’s Dacha”, or some such. This would be Inverness, Russia, then? Our road, the Sir Francis Drake Highway, then turned away from the bay and climbed up and over the Inverness Ridge. As it headed out towards the shore and south towards Point Reyes itself, we began passing a series of ranches, the first of which was labelled “Historic M Ranch”. We gradually worked our way back down the historic ranch alphabet, skipping a few historic letters which were on side roads, and finally passed “Historic A Ranch” before arriving at the Point Reyes Lighthouse visitor centre. Grey whales migrate up and down this coast so, inevitably, they were the subject of much of the display in the visitor centre. Whale sightings seemed to peek in January and March so we were very unlikely to see anything that exciting. There were some California sea lions basking and barking on some of the rocks below the point, though. A series of steps leads down to the lighthouse itself, which would best be described as utilitarian, not being the most attractive lighthouse in the world. It serves a purpose, though, and has done since 1870. The climb back up the steps, said to be equivalent to climbing a 30-storey building, would have been easier without camera rucksacks but that’s the price we pay for tourism. The eastern side of Point Reyes is sheltered. This is Drake’s Beach where the great man supposedly made repairs to his ship, the Golden Hind. We couldn’t be in this neck of the woods without checking out such an historic sight so we called in on our way back up the alphabet of ranches. There are some white cliffs at Drake’s Beach which should, perhaps, have made the crew feel a little more at home. 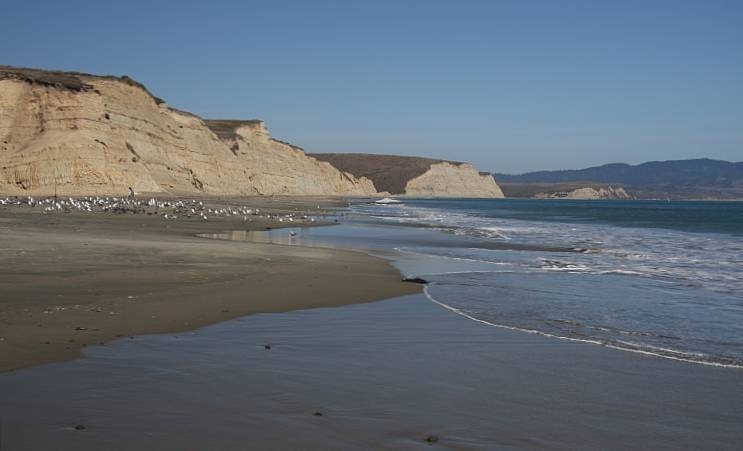 The white cliffs of Point Reyes are not as imposing as those at Dover and Dover doesn’t come complete with Miwok natives with whom Drake supposedly traded but, hey, any port in a storm.